Summary A big Android experience packed into a small seven inch tablet. Samsung's Galaxy Tab is almost ancient by mobile device standards. 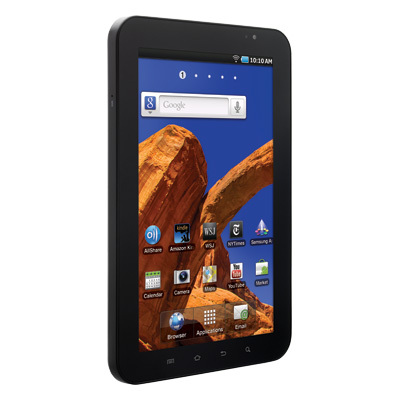 But even though it's not yet a year old, it's one of the more popular seven inch Android tablets. Late last month, the Wi-Fi only version I'm reviewing today was finally released, freeing buyers from the clutches of cellular companies. The Samsung Galaxy Tab WiFi took me by surprise. I wasn't sure a smaller Android tablet would be impressive compared to larger models. But it turns out I was completely wrong. The Galaxy Tab WiFi also showed me that first impressions could be (and usually are) false. This little dynamo has some very nice features and can hold its own against its larger competition. I always pay close attention to a product's packaging and the Galaxy Tab makes a good first impression in this regard. The small box solidly cradles the Tab while wasting little space and providing room for the USB cable, charger, instruction manual and headphones resting underneath it. The tablet itself weighs in at just under one pound (13.6 ounces). After my time spent wrestling with Acer's W500 Iconia, this lower weight was a welcome change. I really noticed it was easier to use for longer periods of time. The Samsung Galaxy is like Ryan Seacrest—tiny, unassuming and very good at what it does. Powered by a 1 GHz Samsung Hummingbird (ARM Cortex-A8) processor and with 512 MB of RAM and running Android 2.2 (Froyo), this tablet is ready to impress. Measuring at 7.48" X 4.74" and 0.47" thick, the Galaxy is extremely easy to hold and carry. Do these small dimensions hinder the ability to use this device? The quick answer is no. I found that the screen size does not hinder use, and actually enhances it. Because this is a smaller tablet, it’s easy to handle and does not become cumbersome when reading for extended periods of time. It is easily held in one hand and can be transported in a purse, small bag, jacket pocket or even in your back pocket. The Galaxy comes in only one 16 GB memory configuration, but up to 32 GB more can be added via a microSD slot. Connectivity options include one USB 2.0 port (via a cable adaptor), Bluetooth 2.1 and dual-band 802.11 a/b/g/n Wi-Fi. Pictures can be taken through a front mounted 1.3 MP camera or from a rear mounted 3.0 MP camera that provides auto-focus and a flash. Crisp and clear. Those are the best words to describe what the screen looks like when it is powered on. The seven inch surface area encompasses a 3.54” x 6.05” 1024×600 pixel display that is surrounded by a black border. Initially, this sounds small and not very useful for a computing device, but that is just not the case. Viewing angles are impressive. When tilted in any direction, there is little fade or washout and the screen remains clear and easy to read. On the bottom of the black border there are dedicated buttons for settings, home, back and search. These are easily placed and blend nicely with the design. The power and volume controls are located on the top right of the tablet. Tapping the screen yields a vibration (haptic feedback) that acknowledges your input. This feature can be turned off but I found it to be quite useful. If you are familiar with Android phones, the initial setup is very similar. When first powered on, the device can be unlocked by sliding the correct input across the screen. Once on the home page, you are greeted with icons that open some of the preinstalled apps like Google Maps, The New York Times and your calendar. The home and navigation screens pop with color and clarity. By using Samsung's TouchWiz 3.0, the Galaxy provides a very pleasing display that rivals even the best tablets on the market. All of the application icons are easy to read and all of the settings icons are easy to understand. If you are a novice user, you should have very few issues learning how to navigate this operating system. Compared to other tablets I have worked with, the Samsung Galaxy just seems easier to use. Navigating thorough this version of the Android operating system is very intuitive. For those that have not worked with Android OS, it will not be difficult to understand. On the bottom of the screen there are quick launch icons for your browser, application screen and email. Applications screens can be navigated by sliding the entire page left or right. There are five screen spaces that are displayed when the Galaxy is unlocked. You can customize these screens to hold any shortcut or icon you prefer. There are three application screens that house additional icons for applications you download. All in all there is plenty of space for organization. Connecting the device to different wireless networks was a snap. By accessing the settings option under the applications window, I was able to search for and seamlessly connect to Wi-Fi. Browsing the internet is also a breeze. The Tab supports WEP, WPA and WPA2 wireless security, so there should be no issue accessing any wireless network you come across. Once connected to the internet, clicking on the browser icon allows Internet access. Even with the smaller screen, I found that typing with the virtual keyboard was accurate and a much more pleasant experience than I expected. It is easy to hold the tablet with both hands and “thumb type”. The keyboard automatically pops up when you click on the URL bar or any other field that requires text input.